The Nation that's bid more than any other* is back at it again. As a Result of this desire 3 Candidates from RV will fight it out for the rights to bid. Shebrooke/Val D'Or(Twin Cities Bid)- Shebrooke and Val D'Or are known as the twin cities situated east of York and the seat of Sherbrooke State. The Cities combined population is 3.57 million. The Cities have numerous stadiums and venues as well as the Coastal Mountain Range to the West and the Lafreuge Mountains to the East for Aquatic events Yorkshire Bay is nearby as are Crystal Lake and the Levesque River. 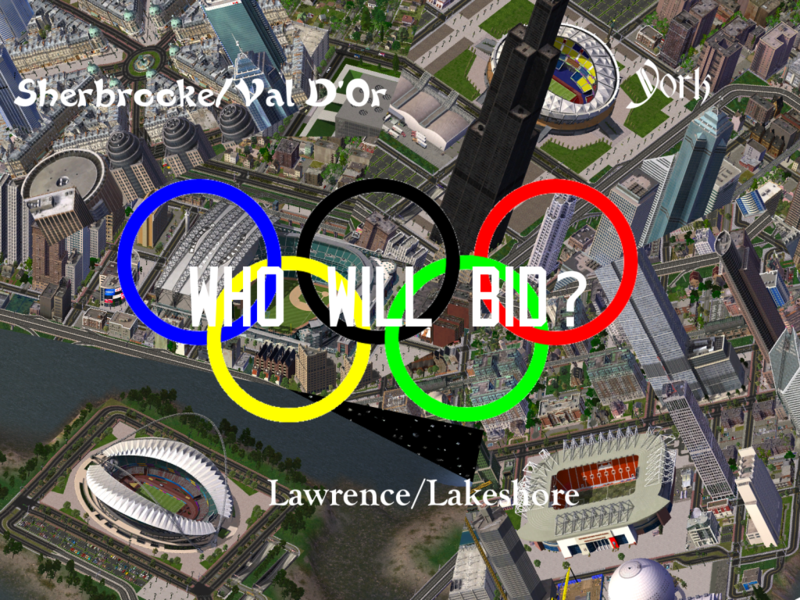 Lawrence/Lakeshore- The same lakeshore that hosted the Winter games is looking to do it again this time with summer and from the West Coast. Lawrence is Rorysville state's second largest city with a population of 1.6 million. The Lake Perry Region of Rorysville State features many chances for athletic greatness. The Southern Mountain Range flanks the City and Lake Perry for sailing events. The City of Lawrence is also the training centre for many Summer Simlympic Sports providing venues well established. York-Host of the First Winter Simlympiad York still has Simlympic Passion to give. The Region has Yorkshire Bay, The Coastal Mountains and plenty of venues for a host. The Main Cities of York and North York will see the majority of the action but the Inlet and Yorkshire Island are readily available for action as well. So who will bid? Only time will tell Rorysville doesn't ask you to give us the games we expect the win. hmmm... More Competition (Me Bid Too)!... Good luck!